There is one thing that will drive producers, directors, Chyron operators, and viewers nuts during the live broadcast of a sporting event. We have become so dependent on this, we cringe when it is not working properly. This thing is the score bug (the persistent score and clock that displays during the broadcast). If it fails, the job of updating the score falls to the Chyron (or VIZ) operator. 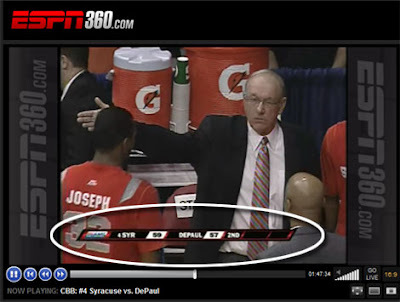 This appears to have happened during today's broadcast of the exciting De Paul - Syracuse game. 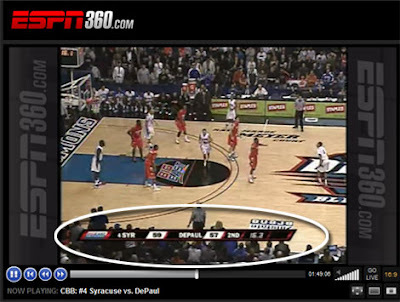 Here are a couple of screen shots from the game as shown on ESPN360.com to illustrate. Adding to the problem was that no one told the on-air talent to tell the audience how much time was left, so the audience had no idea. The next time it came up, the game clock did show the time remaining. This is just one example of how dependent we have become on bells and whistles during a broadcast that, when it fails, fails the viewers.